Northwest’s Ava Jenkins inbounds the ball, guarded by East’s Ali Escamilla in the Mohawks win over the Tartans Monday night. 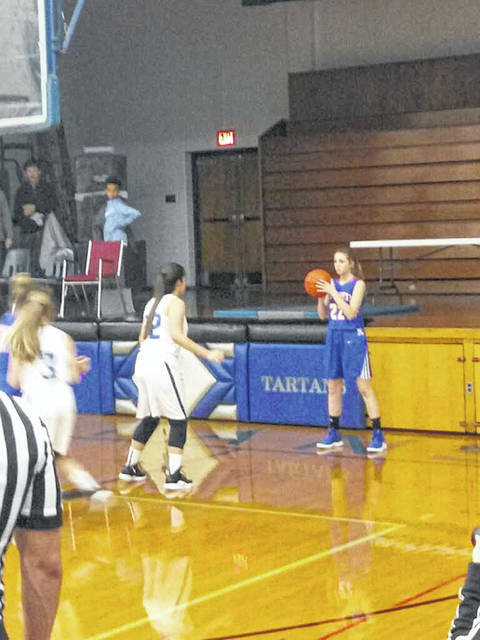 In their first game of the year, the Lady Mohawks walked away with a 55-10 win over Sciotoville East Monday night. Northwest had nine players on the board during the game that ended with three players being in double digits. Kloe Montgomery led the Mohawks in scoring with 11 points for the night, with Keirah Potts and Valerie Eury both scoring 10 points. Northwest started the evening putting up their first score on foul shots by Eury as she went two for two from the line. Skylar Patty followed that with foul shots just a few seconds later shooting one for two from the line, putting Northwest up 3-0. The first points on the board for East came late in the quarter with Felicia Smith going to the foul line and shooting one for two. The first quarter ended with a score of 19-1. Gracie Smith would be the lone score for East during the second quarter helping her team as she went two for two from the foul line. Northwest increased the lead during the quarter with several girls coming off the bench to score for them, increasing the lead to a 39-3 at the end of the second half. During the third quarter Felicia Smith scored two from under the basket for East. Northwest was led that quarter with Sydnie Jenkins, Eury, Haidyn Wamsley, and Audrey Knittel as they ended the quarter with a 47-5 lead over East. The fourth quarter, Victoria Escamilla and Smith would each score to help their team. Northwest saw several girls score and was able to maintain a good lead at the end of the match bringing the final to 55-10 win. Northwest went to the foul line several times during the match up shooting 65% from the line, while East shot 40% from the line for the night. After the win Northwest head coach Dave Frantz of the Lady Mohawks said, “It was a good first game of the season for us. I feel our girls played hard against an improved East team. Our scoring was spread out well tonight as we were very unselfish with the ball. There are still many areas in which we need work. We had too many turnovers and some bad decisions on our shot selection at times. We are still a young team, and these are very fixable things that we will work on. Coach Bowman does a great job with his team. They played hard the whole game and were very disciplined. We will be back at it tomorrow preparing for a very good West team in our first league game Thursday”. https://www.portsmouth-dailytimes.com/wp-content/uploads/sites/28/2018/11/web1_nweast_payne.jpgNorthwest’s Ava Jenkins inbounds the ball, guarded by East’s Ali Escamilla in the Mohawks win over the Tartans Monday night.